US Capital Partners team members Ish Spencer, Marin McElhany and Charles Towle were all in attendance at this week's ACG Conference held in San Francisco's Palace Hotel. 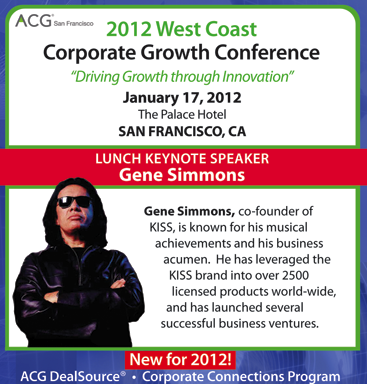 The 2012 West Coast Corporate Growth Conference features a lively variety of keynote speakers including the lead singer of the band KISS, Gene Simmons and Vice-President of Cisco Internet Business Solutions Group, Rick Hutley. The San Francisco chapter of the Association for Corporate Growth was recognized last year as the best mid-sized chapter in the ACG organization. As part of Northern California's premiere middle market event the conference theme was Driving Growth through Innovation and such panel topics included "After the Deal Closes: The Good, The Bad and the Ugly - War Stories."